An elementary school aged boy with a history of pre-B cell acute lymphocytic leukemia with a failed bone marrow transplant was transferred to a regional children’s hospital for leukodepletion and participation in an experimental clinical trial. At that time, his CBC was significant for 10% polymorphonuclear cells and 50% blasts. He was subsequently transferred to the ICU in respiratory failure and developed papulonecrotic lesions on his face, trunk, and bilateral legs. Prior to this, he was pancytopenic with no blasts present with cell counts of 100 WBC, hemoglobin 8.3 and 37,000 platelets. His Fungitell assay, which detects (1-3)-β-d-glucan, was positive. 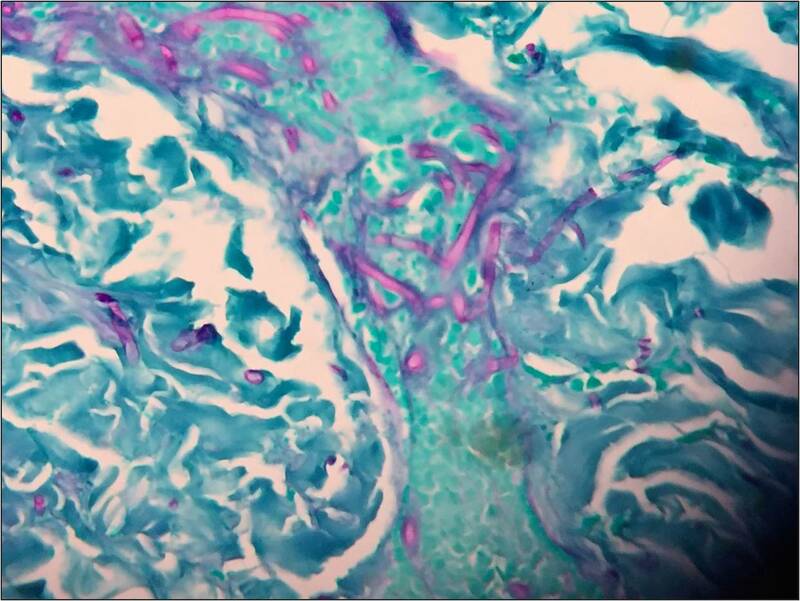 Routine blood culture, fungal culture from the endotracheal tube, and fungal culture from the skin lesion biopsy specimens all had fungal elements on KOH stain. 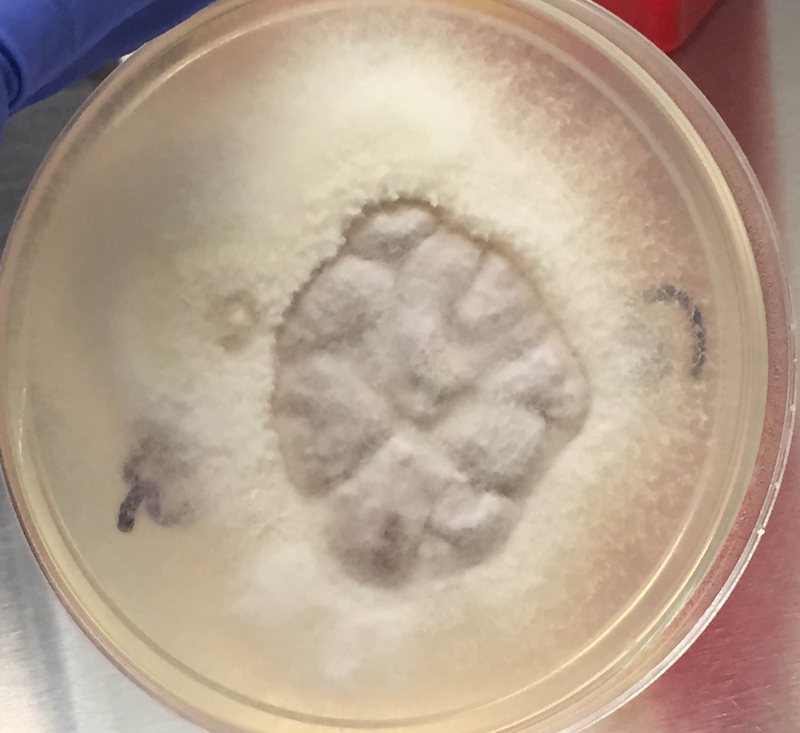 Young growth of a whitish, fluffy mold was present on all cultures within two days. 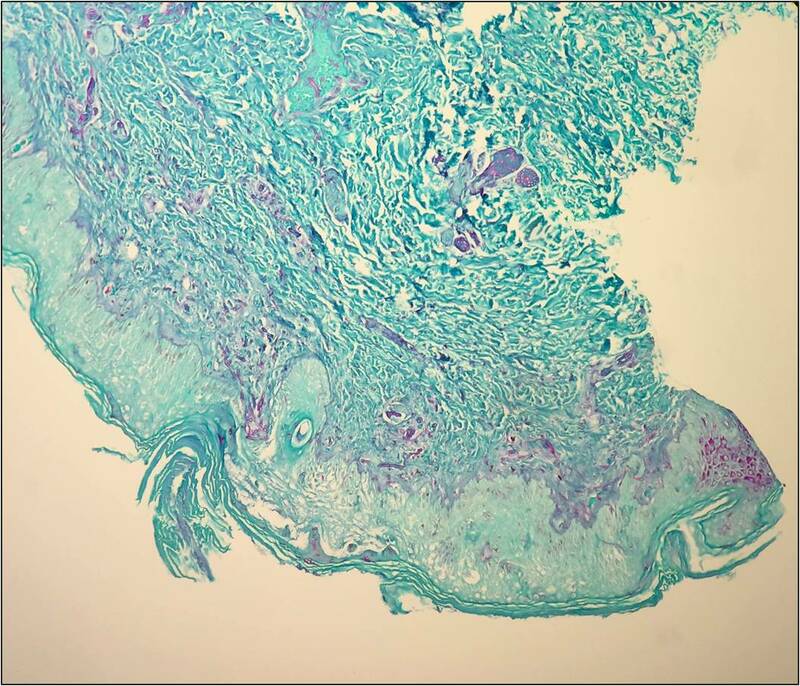 Histopathology on the punch biopsy of a skin lesion on the thigh showed septate hyphae within the dermis, epidermis, and invading the vasculature that was particularly apparent with GMS stain (Figure 1a and 1b). 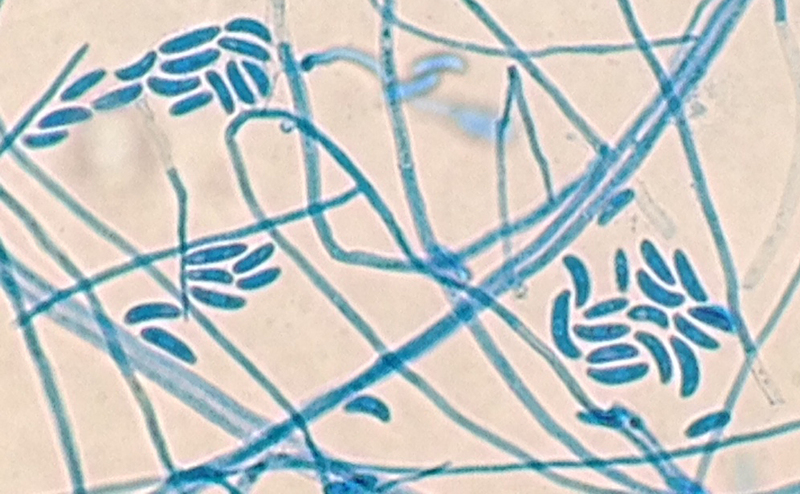 Within a few days, the fungal cultures showed septate hyphae with microconidia using lactophenol cotton blue tape preparation, and shortly thereafter the mold developed into macroconidia with multiple septations taking on canoe-like forms (Figure 2). The white, cotton-like colonies developed a pink tinge (Figure 3). These characteristics allowed for the identification of the growth as Fusarium sp. Septate hyphae on GMS stained section of the skin punch biopsy. Microscopic identification of Fusarium by lactophenol cotton blue stain. Colony of Fusarium growing on inhibitory mold agar (IMA). Fusarium is an opportunistic hyaline mold with infection most commonly seen in immunocompromised hosts. It can cause keratitis through contamination of contact lenses, penetration due to trauma, or use of immunosuppressive steroid ophthalmic solution. It is increasingly becoming the cause of disseminated infection in neutropenic hosts with a broader spectrum of disease, which includes: skin lesions, fungemia, rhinocerebral involvement and pneumonia. In these cases, without an immune system to fight the infection, mortality is high. Inhalation of airborne conidia, ingestion from water sources or access through mucosal membranes are all potential points of entry. The colony growth on plated fungal media is rapid, usually maturing within four days. On microscopic examination, Fusarium hyphae are septate, approximately 3-6 microns wide with acute angle branching. Microconidia are small, oval-shaped, and no larger than 4 x 8 microns in size. These can look like Acremonium sp. Macroconidia are canoe- or sickle-shaped with the largest dimension being about 80 microns in length, exhibiting 3-5 septatations. –Jodi Music, MD, is an AP/CP resident at UT Southwestern Medical Center.